Harrier of the month nominations:	Jane Bryant for running every day in January (RED); Michael Lomas for coming 4th at Mytholmroyd Fell; Harry Sime for RED; Dawn Turner for RED; Jack Wood for firsts at both Stanbury Splash and Mytholmroyd; Martin Archer for first at Skipton parkrun; Steven Gott for great performances at Peco and Northern XCs. The winner is Jack Wood. A special mention for all those Harriers who RED in January. Volunteer of the month: Jane McCarthy for league updates; Petra Bijsterveld for membership work - renewals and developing new process. The winner is Petra Bijsterveld. From Caroline Howe... The Meltham (tough) 10k is indeed TOUGH... it is pretty much five miles of ascent, with almost all the descent in the last mile. It was made tougher still with strong winds, which made even some of the downhill hard work, but thankfully it was relatively mild and dry so conditions could have been worse! It was great to see eight Harriers make the trip across to this one, scoring their first IH league points of the year. This is a great race with a friendly atmosphere and lots of small-event charm... a bottle of beer for all participants, and a clubhouse full of cake afterwards topped off an enjoyable morning out! Well done to all who took part! From Petra Bijsterveld ... The Northern Cross Country Championships took place on our doorstep in the grounds of Harewood House this year. The rather undulating course, whilst quite runnable overall, had deep squelchy mud in places, sucking at one's shoes and sapping much of any power in the legs one might have felt whilst still in the starting pens. One would not expect anything less on a decent XC course! A stiff breeze added to the overall challenge. There was good running of our under 13s and under 15s (to be reported on the junior website). In the under 17s there were exceptional results from Euan Brennan, Dom Coy, Cameron Reilly and Bethan Morley. Euan and Cameron have come into the senior club in 2017, and Dom and Bethan will become seniors later this year, and there is much to look forward to from these young people. 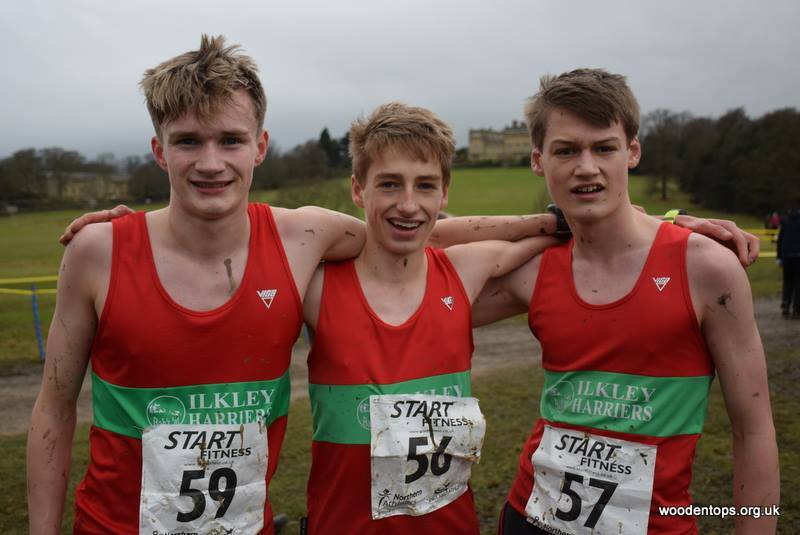 Unfortunately it needed 4 athletes for a team ranking, had we had another U17 male then Ilkley would have been first team. 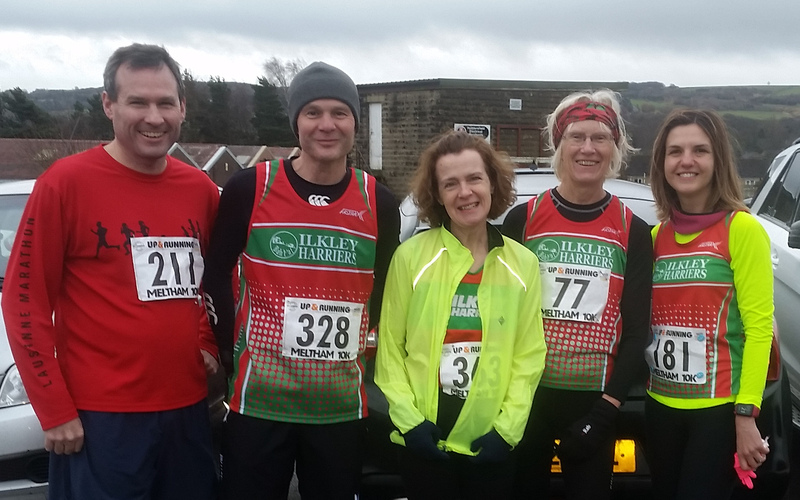 In the seniors an outstanding result came from Jack Wood who was 18th in an elite field, Pauline Munro led the Ilkley women home in 57th place. I think it is fair to say a good day out was had by all of us. Regardless of ability or pace, the struggle across the terrain is a great leveler and brings about a lovely team spirit. Next stop the National Championships on Parliament Hill in 4 weeks. From Petra Bijsterveld ... Tom Adams returns from injury to timed running (mantra: parkrun is a run, not a race!) with a first finish at Bradford, 3 minutes ahead of no.2. Also making an appearance at Bradford were Dave Reynier who has joined us from Saltaire Striders, and Paula, welcome both! Will Worboys was delighted to knock 30 seconds off last week's time on his return to running after a long lay-off. Martin Archer also flies the Ilkley flag with a brilliant first finish at Skipton against what looks like some fierce competition. Chris Cunningham tries another parkrun in Oz this week whilst the rest of us continue to battle the Yorkshire wind and rain. From Val Kerr ... Dusted off my fell shoes today for my first 'race' for about 12 months, the second in the KWL series run around the grounds and surroundings of Giggleswick School. 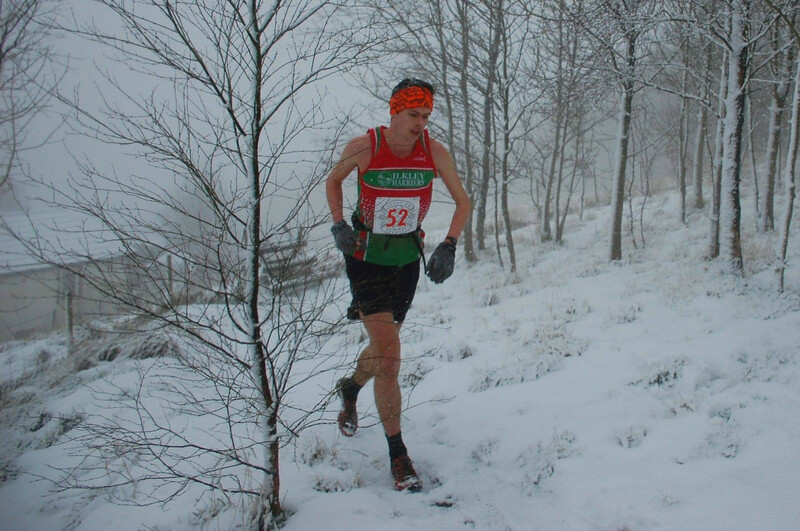 Today's race took place under challenging conditions with a blizzard just before the start, rain, deep mud and a very cold, knee deep stream that had to be crossed twice. I survived with numb feet and hands and was pleased not to finish last. This series of races is organised by Helm Hill running club and is similar to the summer BOFRA series with points given for the best 7 of 11 races in the series. Its worth a look at these short (4-5 miles, and cross-country or low fell) and fast races located around the Southern Lakes, Sedbergh and Oxenholme. From Petra Bijsterveld ... Due to icy conditions many local parkruns, with the exception of Skipton, were cancelled. Chris Cunningham flew the Ilkley flag at parkrun Australia this week, and I found myself in Germany where parkrun is just starting up. With just 33 runners on a one lap course around a small lake there was plenty of space to run! The annual Ilkley Harriers celebration and awards 'do', this year at the Wheatley Inn.